What is the Ariel Ambulance? This is the flying ambulance that Wash found in the dump, fixed up in the belly of Serenity, flew to the hospital with "dead" Simon and River, etc. in the episode "Ariel." It is a prop: wood frame, fiberglass shell, approximately 5' wide, 8' tall, 20' long body, 20' long tail (detached at the moment). All fins (but one?) are accounted for, however the two engines on top may be missing. The door works, but the inside is bare and there are no window panes. We hope to restore all this eventually. 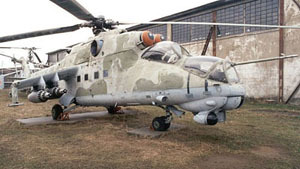 It appears to be modeled after the Mi-24 Hind Soviet Helicopter (known as the Flying Tank). Akin spotted it (even before he knew what it was--a friend introduced him to Firefly later!) last summer in an aircraft scrap yard on the side of the road on his way to Las Vegas-- The Find You can read more of Akin's Ariel-Ambulance-related LiveJournal entries listed below. The ambulance began as a mockup of a Puma owned by Air Hollywood; it was modified to look like an Mi-24 Hind. Air Hollywood sold it to Mark Thompson's Aviation Warehouse. Carey Meyer, production designer for Firefly, rented the ambulance; the Firefly crew modified and repainted it to be the Ariel Ambulance. 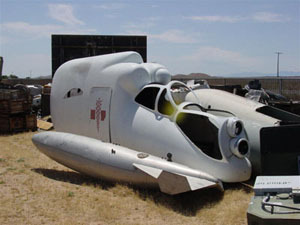 After the episode Ariel was filmed, the ambulance was returned to the Aviation Warehouse, which later sold it to the El Dorado Aircraft Supply Co. ltd. which kept it in their scrapyard in Mojave, CA where Akin happened upon it. The Ariel Ambulance Rescue Group purchased it from the El Dorado Aircraft Supply Co. on Saturday May 6, 2006 (dubbed "Ariel Ambulance Day"). Our intentions are to purchase it (done! ), restore it (starting Saturday June 3, 2006 and continuing as time, money, and resources are available), and take it around to conventions, stopping off at museums in between. So will this be like a traveling museum? Yes! The Prop Store of London has donated some items used in the movie Serenity: an Alliance Lab Assistant costume, an Alliance medkit prop, and two bank heist money displays to travel with the ambulance and/or be auctioned off--so donate now before we resort to selling off these precious items! We'd love to add to our traveling collection the "Ariel" shooting script used and recently donated by Adam Baldwin (Jayne). This script (signed by Joss and cast!) will be up for auction by the California Browncoats September 20-30, 2006. So far, scripts have sold for $960-$3650. All proceeds go to Adam Baldwin's favorite charity, the Marine Corps-Law Enforcement Foundation which grants scholarships to the children of fallen heros. Help us win the bid and bring "Ariel" to the fans-- Donate Now. UPDATE: Sorry folks, but we lost the bid on the Ariel script. We're trying to contact the winner to work out some sort of borrow, loan, or marked copy arrangement. Which conventions will the Ariel Ambulance appear at? The ambulance was a special exhibit at WorldCon aka LACONIV aka the 64th World Science Fiction Convention in Anaheim, CA the weekend of August 23-27, 2006 and MountainConII in Salt Lake City, UT the weekend of September 22-24, 2006--the same weekend as the Browncoat Ball in San Francisco, CA (the Ball was too tight for space to host the ambulance this year). We're taking care of the final details now in order to display the ambulance at DarkCon in Phoenix, AZ January 4-7, 2007. 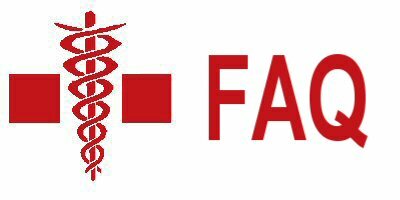 If we can fill in the geographic gap, the ambulance will be on display and in the SciFi parade at OmegaCon in 2008. I want to see the ambulance at the next convention I'm going to! How can we make that happen? Contact Conventionizer Cider with the name and web address of the convention-- if you can find the dates, location, contact info, and general theme of the convention, that information would be helpful too. Contact the convention and express your interest in the ambulance. I'm organizing a convention, and I want to book the ambulance. What do you need from me? Please contact Cider or Adam with the name and website of your convention, so we can add it to our lists and website. Display space is an issue--the ambulance is on a trailer, so needs space about 8' wide, 10' tall, and 40' long with it's tail. Inside or sheltered display space is prefered, as certain weather conditions may be detrimental to the ambulance and unfriendly to visitors. Transporting the ambulance requires volunteers on either end to load and unload, volunteer driver(s) with a 1/2+ton vehicle (truck, SUV, suburban,...) with class-III hitch (rated for 500lbs tonuge weight) to tow the ambulance, and gas money (about $.30/mile)-- any help would be greatly appreciated! Also, we would like permission to accept donations, sell our merchandise, and charge for special photo opportunities (e.g. sitting in the pilot seat, wearing a St. Lucy's paramedic uniform replica). One or two comp passes for the volunteer driver(s) and a table for the merchandise and display would be nice. I have more questions. Where can I post? Who can I ask? You can join the Ariel Ambulance Rescue Group Yahoo! Group. There are also Ariel Ambulance threads on the new Serenity Movie Board (listed below). You can also email Organizer Adam.